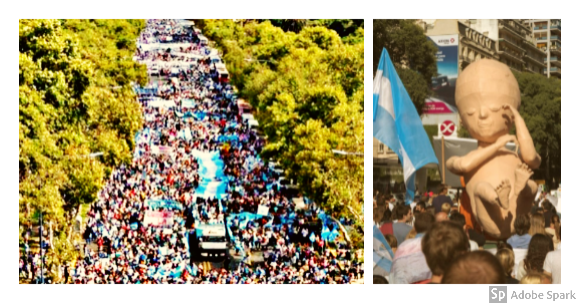 This Saturday, March 23, 2019 the March for Life in Argentina had over 2 million people across the country walking in defense of the life of the unborn child and the mother. According to the organizing committee the figure in Buenos Aires amounted to some 300 thousand people and there were more than 2 million 500 thousand people spread over 210 cities in the country such as Tucumán, Córdoba, Paraná (Entre Ríos), San Luis, Catamarca, Rosario, Reconquista ( Santa Fe), La Rioja, Santa Rosa (La Pampa) and Salta, among others. Alejandro Geyer, organizer of March for Life Argentina, appeared on stage and explained that this year the march was carried out for three main reasons: "The right of all to be born, the right of families to educate their children without ideology of gender and the need to be aware that in our country, especially in this year of elections, we define the future of the country, of the family and of millions of unborn children. " The main pro-life march took place in Buenos Aires with the slogan “In Defense of the Two Lives.” Many people carried signs and balloons and wore blue. Catholic, evangelical Protestant, Jewish and Islamic leaders all participated. Abortion has been illegal for decades in Argentina.